The James K. Polk Memorial at Pineville in Mecklenburg County, the probable birthplace of the nation's eleventh president, consists of a reconstructed house, kitchen, and barn as well as the relocated Polk family cemetery. Polk was born at the family farm on 2 Nov. 1795, but the family moved to Tennessee when Polk was 11 years old. Although he returned to the state to attend the University of North Carolina in Chapel Hill, Polk achieved fame in Tennessee, and no thought was given to the significance of his birthplace. By 1900 the family's log house at Pineville had fallen to the ground, but four years later the local chapter of the Daughters of the American Revolution erected a stone pyramid and plaque at the site. Historians in the mid-twentieth century began to conclude that Polk had been one of the most successful American presidents, and thought was given to preserving his birthplace. Under the leadership of James A. Stenhouse, a Charlotte architect and historian, funds were raised locally, grants secured, and legislative support enlisted. In 1964 Polk's birthplace became a North Carolina State Historic Site. A donated log house and other building materials, dating from the time the young Polk lived at the site, were used to reconstruct buildings such as would have been familiar to him. A visitors center at the 21-acre site features a theater and exhibits depicting the life and times of Polk. James J. Horn, "Trends in Historical Interpretation: James K. Polk," NCHR 42 (October 1965). Charles Grier Sellars, "Early Career of James K. Polk, 1795-1839" (Ph.D. diss., UNC-Chapel Hill, 1950). 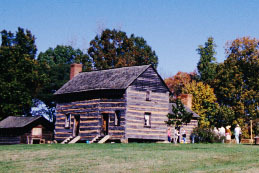 "Reconstructed log cabin similar to one young James K. Polk lived in at the Pres. James K. Polk State Historic Site near Pineville." Image courtesy of the James Polk NC Historic Site. Available from http://www.nchistoricsites.org/polk/main.htm (accessed June 28, 2012). I am the son of Carrie Lilly Dobson of Mt. Airy, N.C.
Is there something the state can do to get the family grave yard located on the old plantation in Surry County, Dobson N.C. made into a state Historical site? There are pre-Colonial relatives there, and some of the Polk family (females/wives) of prominent Dobson family members. Also Harrison, etc. Also the slave grave yard is on the old plantation property East of the family plot and North of the Yadkin River. Thanks for visiting NCpedia and taking time to post your comment. That's a great question. A good resource for this question is the State Historic Preservation Office. They will be able to help you with questions about preservation and preservation status. Here is a link to their web page where you'll find links to their contact information and preservation topics: http://www.hpo.dcr.state.nc.us/nrhome.htm. You may also be interested in this NCpedia entry on North Carolina sites listed on the National Register of Historic Places: http://ncpedia.org/national-register-historic-places-north-carolina.